Western embassies and military compounds are now prime targets for explosives-laden trucks. In the Persian Gulf, Arab nations brace for surging tide of religious fervor. Where is the Middle East headed? ABOUT one year ago — on April 18, 1983 — a suicide truck bomber attacked the U.S. Embassy in Beirut, Lebanon, resulting in the deaths of 63 people. It was to be a grim omen. Six months later, early Sunday morning, October 23, two horrendous explosions minutes apart flattened the American and French command posts in Lebanon. The death toll: 241 U.S. Marines and 59 French paratroopers. It was the worst single-day loss of life for American military personnel since Korean War days. For the French the loss was the greatest setback since the fighting in the Algerian War of Independence in the late 1950s. The spectacular eruptions were the direct result of explosives-laden trucks driven into the compounds by drivers willing to commit suicide in the process. Then on November 4, less than two weeks after the combined assault on the U.S. and French forces, a suicide bomber struck at the Israeli military post in the Lebanese port of Tyre, killing 61 people. Events soon proved that this new tactic was not to be confined to Lebanon. On December 12 a dump truck packed with explosives was driven into the U.S. Embassy compound in Kuwait City, killing five people and wounding 37, officials said. It was one of six bombs that rocked the Persian (or Arabian) Gulf nation within minutes of each other. Other targets were the French Embassy, Kuwait airport, an American housing complex outside of Kuwait City, an oil refinery complex and an electrical and water control station. The Kuwaiti bombing highlights a weapon — an explosives — laden truck — and a technique — a wild suicide rush — that threaten to overwhelm even the most stringent security precautions. A decade ago, incidents directed at diplomatic personnel were limited largely to kidnappings and occasional assassinations of individuals. Those tactics seem almost tame in comparison to these new methods. Just before the Kuwaiti episode, security was greatly stepped up at the White House in Washington, D.C., as a result of solid indications that elements involved in the Middle East violence had threatened to carry out attacks against President Ronald Reagan and his administrative staff in the United States. Concrete barriers were put in place around the executive mansion. Then came reports that ground-to-air missiles have been placed on alert against a literal kamikaze — like airplane attack. Experts in terrorism warn that governmental buildings in Washington, the world's most open capital, are virtually defenseless against this new style of warfare, much of it imported from overseas because of U.S. involvement in Middle East disputes. Said Ray Cline, a security expert: "The weapon of the '80s just might be the half-ton pickup truck loaded with explosives." After the attacks in Kuwait, an organization called the Islamic Jihad (Islamic Holy War) called a Beirut news agency to claim responsibility. The same group had claimed responsibility earlier for the October 23 attacks in Lebanon as well as the April 18 attack on the U.S. Embassy. The Iranians are accused by American officials of working with fellow Shiite political-military groups in Lebanon that have become imbued with the fervor of the Iranian revolution espoused by the Ayatollah Khomeipi. In highly sectarian Lebanon, Shiite fundamentalists are implacably opposed to Western military forces whom they see as military props behind the weak government of President Amin Gemayel. The Gemayel government, the Shiites understandably contend, is strongly biased toward Maronite (Christian) Arabs, the traditional moneyed class in Lebanon. American intelligence believes that the one who masterminded the October suicide bombings was Hussein Mussavi, leader of the Shia Muslim Party of God. Mussavi denies it, though he told a Times of London reporter: "I personally consider this deed is a good deed which God loves and which his prophet — may God praise his name — loves. I bow before the souls of the martyrs who carried out this operation." For more than three years, a bloody war has raged between Iran and Iraq. Syria supports Iran in the struggle while France is Iraq's main Western ally and arms supplier. The fact that in October the French command post was destroyed — and not the Italian or the British post — is viewed by Americans as another clear indication of involvement on the part of Iran and its supporters. The Iran-Iraq war has already proved to be incredibly bloody. Some estimates put the number of dead so far as high as 500,000, many of them the result of human wave attacks by Iran's revolutionary guards. For its part, Iraq has suffered the loss of 50,000 dead and another 50,000 captured. It is generally believed that Iran, richer and more populous, is gradually wearing Iraq down in this war of attrition. Iraq's oil route out through the Gulf has been blocked, cutting revenues to the Baghdad regime, forcing it to rely on vast monetary grants from Saudi Arabia and the smaller Gulf states. These all are worried over the spread of revolution from Iran. In a further escalation of the Gulf conflict, Iraq has received from France five Super Etendard fighter-bombers. Iraq already has on hand approximately 30 long-distance over-water Exocet missiles of the variety that wrought havoc on the British Royal Navy in the Falklands War. Iraq's apparent aim is to destroy, or at least threaten to destroy, Iran's Kharg Island oil terminal complex, as well as to warn foreign-owned tankers not to load oil there. Already two merchant ships have been sunk off the Iranian coast, presumably by Exocet missiles. Iran, in turn, has threatened to block the Strait of Hormuz entrance to the Gulf should its oil facilities be wiped out. If a blockade is successful — no one knows whether Iran's navy is capable of carrying one out — 40 percent of Western Europe's oil needs plus 60 percent of Japan's would be cut off, crippling the world's economy. The Pentagon has prepared a mobile strike force to intervene if necessary to keep the Gulf open. Should such a force be used in any action in the area, an embittered Iran might try to destroy Saudi and Gulf state oil facilities across the Gulf in retaliation. In expectation of this, the states of the Gulf Cooperation Council (GCC) — Saudi Arabia, Kuwait, Bahrain, Qatar, the United Arab Emirates and Oman — held their first ever joint military exercises last October. They are talking of establishing what one source called a "small — scale NATO of their own." The revolutionary government of Iran is intent on propelling its "holy war" throughout the largely Sunni Muslim Arab world. Whether the Shiite revolution overthrows the states and tiny sheikdoms of the Gulf largely depends on the outcome of the Iran-Iraq war. Throughout the Arab world, governments adhering to the more moderate Sunni branch of Islam are becoming more strict in enforcing religious observance, all in an attempt to insulate themselves from the radical fundamentalist Shiite influence. "In Islam," Dr. Habsburg continued, "there is a deep difference between the Shiites and the Sunnites. The Sunnites are a very constructive element, whereas the Shiites are from time to time extremely explosive .... If the Iranians win against the Iraqis, you can't stop it anymore.... I don't say that the Shia will rule all the way to Morocco, but there will be explosions everywhere and there will be another unsettling element entering into the [world] picture." No country in the Middle East is free of entanglement in the escalation of regional violence, not even those countries seemingly at peace. One of these countries in the Middle East is the kingdom of Jordan. The author recently spent five days there in its bustling capital, Amman. Jordan is actively supporting Iraq in its life-or-death struggle against Iran. This support was much in evidence on a side trip taken to the south of Jordan. The two-lane blacktop Desert Highway is the main arterial road from Amman south to the Gulf of Aqaba, Jordan's only port. The road transports a major portion of military supplies overland to Iraq. An incredible amount of truck traffic uses this road, especially at night when the vehicles operate in convoys. The outcome of the Gulf war is not the only concern of the Jordanian leadership. Jordan's pro-Western but cautious King Hussein is confronted now with perhaps his most difficult decision since he assumed power in the kingdom 31 years ago. The decision he must make is whether or not finally to negotiate with the state of Israel on Middle East matters, in effect joining the U.S. — engineered "peace process." The latest setback of Palestine Liberation Organization chairman Yasser Arafat would seem to ' offer the King the opportunity to reassert Jordanian authority in the West Bank. Yet the King — the target of 11 assassination attempts during his rule — is wary of exercising such an opportunity because of Syrian opposition to the American — supported peace process. Moreover, Jordan's ruler is said to be dismayed over U.S. ties to the state of Israel that have broadened to become what some call a "strategic cooperation." The King has concluded this further weakens American credibility throughout the moderate Arab world. The new strain of "holy war" is threatening to sweep over the whole of the Middle East. This most pivotal piece of global real estate is destined to feature prominently in an end-time climax foretold in your Bible. 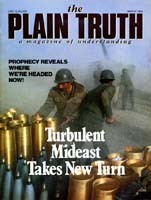 According to prophecies revealed to the ancient prophet Daniel, a conflict centering on the Middle East will presage the end of this present civilization of man and the establishment of the government of God over all nations. As in the Middle Ages, and today again in Lebanon, Islam and Christianity will clash, only this time the direct reason will be economic as well as religious — very likely the impending cutoff of critical oil supplies over the issue of the future of Jerusalem and the West Bank. Military forces out of Europe attempting to stabilize the volatile Middle East, will sweep into the "Glorious Land" — the Palestine region (Dan. 11:41, Revised Authorized Version). Many countries will be taken over. "Jordan has caught the eye of the European Economic Community and will probably be playing a major role in the EEC's future relations with the Middle East." The United States thought, naively, it could enter Lebanon as a "peacekeeping" force. Instead, America and other Western powers are being sucked inexorably into the swirling vortex of the Middle East, with all of that region's unbridgeable divisions and implacable animosities. In the final analysis, all the strife in the Middle East is centered around the "Glorious Land," and its legendary city, Jerusalem. Who will control this much fought — over city? The Jewish state of Israel? The Arab world — if so, which branch of Islam? Or will it be established as an international city, as proposed by the Pope? It is always tempting to try to "bring peace" to the Middle East. Almighty God prophesied, however, that men would fail abysmally in this attempt. Through the prophet Zechariah, God foretold that "it shall happen in that day that I will make Jerusalem a very heavy stone for all peoples; all who would heave it away will surely be cut in pieces, though all nations of the earth are gathered against it" (Zech. 12:3, RAV). Yes, even if "all nations" — a prophetic term for a powerful United Nations' police force — should try to bring peace, they will fail. Not long ago Jordan's King Hussein remarked: "The Almighty in his wisdom, did not make Jerusalem that important and touchy a point in the hearts and souls of all of us — Jews or Christians or Moslems — except to offer us a challenge to learn how to respect each other and live together. Jerusalem must be the essence of peace, a symbol of peace." Not many years from now Jerusalem will represent more than the mere aspiration for peace. It will be the very fountainhead of peace, for the benefit of nations around the world. "For out of Zion shall go forth the law, and the word of the Lord from Jerusalem" (Isa. 2:3, last part). "Great peace" will be the result of divine intervention in human nature and affairs, with humans everywhere learning to love and obey God's law (Ps. 119:165). Jerusalem will be the capital of the government of the kingdom of God in the coming World Tomorrow. It will no longer be the chief bone of contention between major nations and religions. But until that happy day dawns, more tragic lessons will have to be written in blood.